It has been a while since Part 1 was published. Farming dragon whelpling pets has been in the game since vanilla, and they are still a decent gold maker. Gold making tips like these, however, take either tons of luck or time. Do not attempt this if you're not feeling lucky or don't have a few hours of free time! There are better ways to make gold, so don't spend too much time on this if lady RNG does not favor you today. Also, see the pet's current AH price first. Azure Whelpling companion pet can drop in 2 places only. 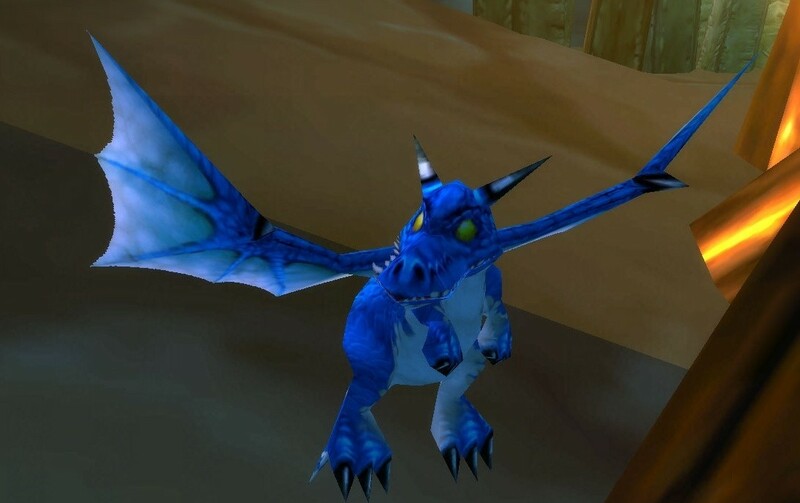 Pre-cataclysm, Azure Whelplings were obtained from blue dragonkin only. After Cataclysm, Azure Whelpling companion pet now drops from any monster in Winterspring. Although rare monsters have a slightly better chance at dropping this. Visit Loot Hunter for all you need to know about rare spawns in Winterspring. Winterspring is a level 50+ zone, so make sure your toon is strong enough. Misty Satchel of Exotic Mysteries was also added to the game some time ago, and it may also contain Azure Whelpling, although it's such a low drop chance, it's faster to obtain it if you just farm it by killing things, instead of queueing as a tank or healer. Where is the best place to farm it? The only good way to farm it these days is to fly around Winterspring and kill everything that moves, or click on the names below and see if their spawn points are yours to claim. If you have followed my blog for long, you may remember that I have mentioned Ice Avatar farming previously too, although not because of the possible Azure Whelpling. Click here if you want to read about it. Found it! How much should I sell it for? If there is no one else selling Azure Whelplings, you're in luck! You can decide the price yourself now. It's average price on wowhead is 13,000 gold. That is a good amount to start with, and reduce it bit by bit until a pet collector sees it and deems the price fair enough.